If you are looking for a quick and easy whole-food plant-based recipe to try, you have come to the right place! I was playing around in the kitchen one day recently (mainly trying to figure out what I could make with what I had on hand, as usual) and came up with this one-pot recipe and it was so easy and SO delicious that it has become a regular occurrence for us. Heat several Tbsp water in a nonstick 12″ Skillet over medium-high heat, until water starts to boil. Add frozen veggie mix & heat covered, stirring occasionally for several minutes or until defrosted & hot (add water as needed, 1 Tbsp at a time, to prevent sticking). Add rice, chickpeas, taco seasoning & 2 Tbsp water if needed. Mix thoroughly. Cover & heat through, stirring occasionally & adding water as needed to avoid sticking (1 Tbsp at a time), about 3 minutes. Serve as fajita bowls or on corn or whole wheat tortillas with preferred toppings. First, I want you to know what exactly I use when I make this recipe. We have a Trader Joe’s super close to us, and since they have very clean food (non-GMO and much organic) & are relatively inexpensive, I get many of my groceries there, but if you don’t have access to one, you can use any brand. 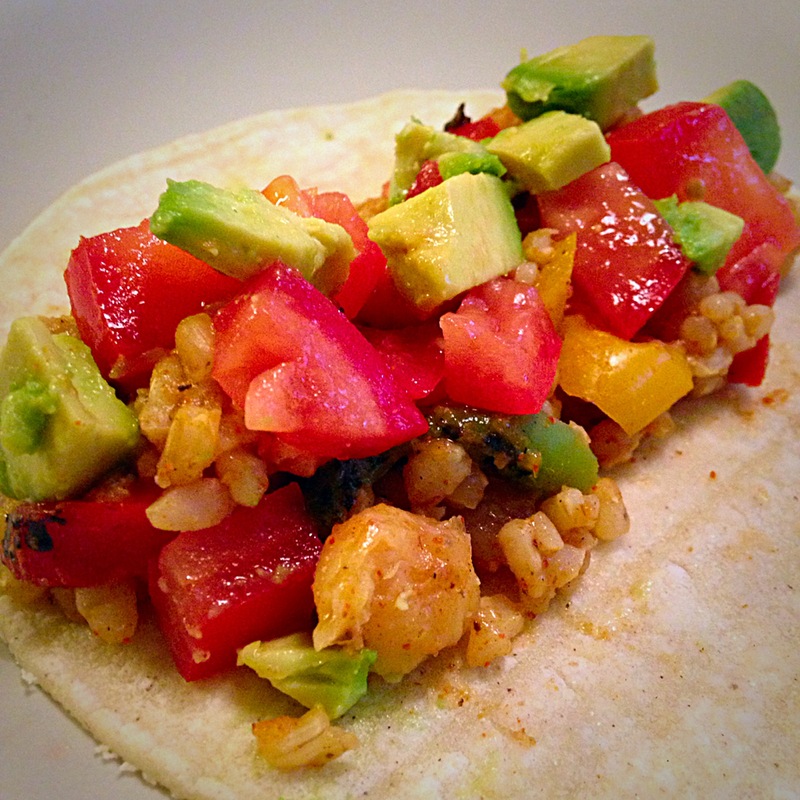 My frozen veggies and taco seasoning for this recipe are from Trader Joe’s. If you prefer to use fresh veggies, kudos to you! I would estimate that it’s one small white onion and three small peppers – red, yellow, green, one each, preferably grilled but not necessary. But do remember that using fresh veggies WILL add time. Why frozen veggies? Freezing fruit and vegetables does not cause much loss of nutrients at all, so if it means you will eat fruit/veggies vs. not at all, then don’t feel guilty! Stock up! Now, if you’ve ever used the Trader Joe’s Taco Seasoning then you know that it is super spicy so I only use half of the package. This also cuts down on the sodium content. Their seasoning also doesn’t have to simmer for any length of time, so you add it, mix it and boom, done! Other brands should work equally well though you may have to play with the amount you add to taste – just watch the sodium content as well as for any additives! One way to make this recipe way faster is to cook your rice and beans in bulk on the weekends and then they are ready for you to add to recipes throughout the week. When I have this already done, this recipe takes me about 15 min to make plus another 5 min for prepping & cutting up toppings. VARIATIONS: Another tip is that you can use any bean or grain you like or have on hand. 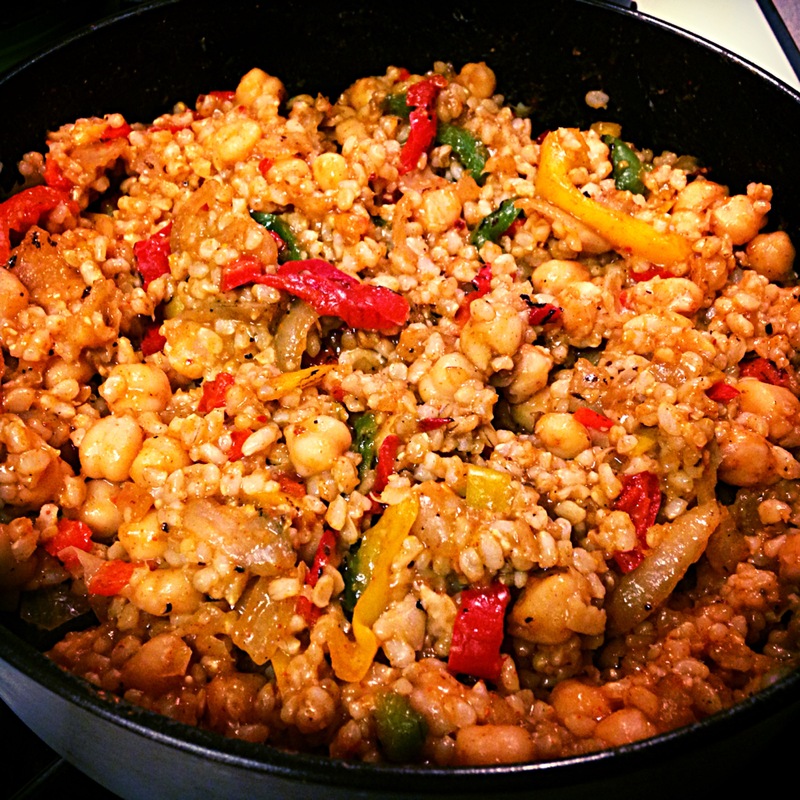 We like chickpeas and brown rice best for this one but I have made it with pinto beans or lentils and it’s still great! I typically add 2 cups of beans but 1 ¾ cup is the equivalent to one can and it will still be great with these measurements. I’ve also made this with quinoa, but we do prefer rice. I’ve used brown basmati rice, brown rice, short grain brown rice, & long grain brown rice. I think it’s great with any of these rice varieties! Quinoa is great when you’re in a pinch since it cooks pretty quickly when compared to brown rice. ← How Much Protein Do We Really Need? OH thank you so much for sharing 🙂 YUM!